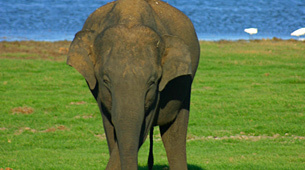 Sri Lanka’s elephant populations are currently threatened by deforestation, land degradation, and unregulated exploitation of natural resources. Effective human-elephant conflict mitigation cannot take place in the long term without the involvement and true support of the local communities. Similarly, rural livelihoods depend on a flow of natural resource benefits, many of which cannot be sustained without active protective measures. To build these partnerships requires greater understanding about working with local communities in designing programs to realize joint benefits. It also requires effective community empowerment to allow the communities to plan for their own future. This phase of this previously IEF funded project will establish a community-based elephant monitoring program at pre-selected sites and provide an awareness program for the affected communities while introducing eco tourism as a tool to mitigate human-elephant conflict. During the initial stage of the project, each site will be mapped and the mapped area will be categorized into zones based on specific vegetation types, availability of water, human settlements, and cultivated areas. A monitoring officer and a volunteer officer will be recruited from each zone to conduct interviews, carry out daily observations and maintain detailed records of the number of elephants sighted and composition of the herd, behavior of the elephants sighted, prevailing weather conditions, season, month, day, time etc., state of human settlements at the site, patterns of crop raiding, and a description of habitat at sighted location and identification of vegetation/cultivated crops being ingested. Community based group discussions will be held with the topic for each discussion selected by the community. Information on human elephant co-existence, potential eco-tourism practices using printed booklets, posters, leaflets, audio, visual presentations etc. will be presented to the group. This community based group will maintain records of ideas and suggestions arising from each group discussion such as traditional methods used to mitigate the human elephant conflict and constraints on minimizing the problem. Individual participants from these group discussions will then be selected to participate in a three-day workshop. These workshops will be conducted every three months during the project period for a total of four workshops at each site. The workshops will educate and exchange methods and techniques which are practiced to mitigate the human elephant conflict at each site. In addition, the selected groups will visit the Elephant Orphanage and National Zoological Gardens which will help to change existing attitudes towards elephants.